The High Point Furniture Market in North Carolina is held twice a year and showcases the new and best products vendors have to offer in the home décor industry. Buyers come from all over the world to see what’s new and exciting in the ever-changing design world and to order product for the next year. I was lucky enough to attend last year’s fall market as well as this year’s event. I can honestly say it was just as exciting the second time as the first. Something about the crisp mountain air makes you want to buy things. Or maybe it was all of the beautiful product displays. Either way, both Atlanta and Aiken’s Nandina stores have some good things coming! We took notice of some trends that seemed to be repeated in multiple showrooms and were relayed by the new products of various designers. Many companies this year accessorized with neutrals, especially black and gold. Black is back! Gold is definitely still in this season. Art and accessory companies like Arteriors, Natural Curiosities, and Uttermost embraced this trend and were spot on. Upholstered leather furniture pieces populated many spaces, and shagreen and snakeskin were also present in many designs. This city chic look will be gracing many magazine covers this year. On a softer note, many upholstery and fabric companies embraced the pastel look this market. Kravet introduced their new furniture line and brought with it the lighter more subtle colors of spring. 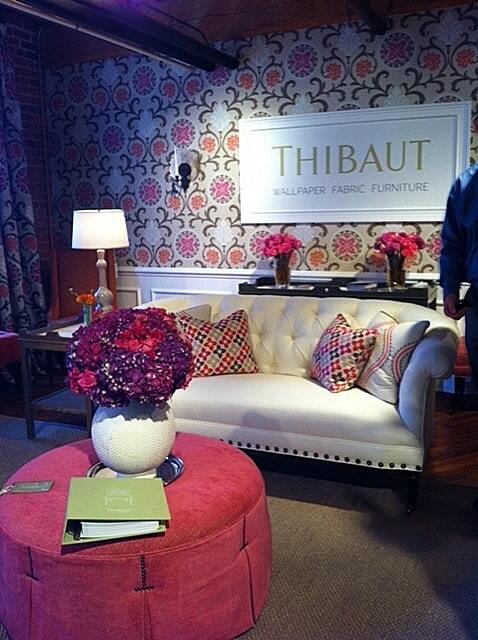 Thibaut absolutely wowed us with their pink and baby blue fabric and wallpaper displays. The Norwalk showroom showcased lavender as a hit color. Lee Industries and Hickory Chair Furniture were fond of a soft, feminine pinkish purple velvet that was shown in multiple places in their showrooms. In my opinion, few bold color statements were made at the market, but beautiful, lighter colored pieces made their debut. Rustic wood sculptures and beautifully crafted porcelain vases were some of our hot finds at this market. By visiting vendors like Go Home, Golden Oldies, Continental Home and Legends of Asia, we found many different exotic pieces that will give depth and a unique story to the homes of our interior design clients. Globes for desks or bookshelves and differing pottery pieces add a rustic, worldly charm to any space. The Californian, natural design aesthetic was alive and well at market. I hope these help to bring current looks to your space. Stop by the Atlanta Nandina in Inman Park or our South Carolina location in downtown Aiken and bring your home to life!